The Indianapolis 500 is one of the most explosive races in America! 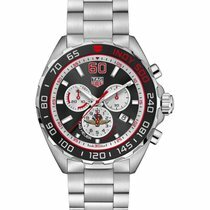 Tag Heuer has always been closely tied to the sport and what better way to show that to come out with its very own Indy 500 model, the official timekeeper and scorer of the Indy races. This particular watch dates back to 2006, it’s sturdy, well built and chunky design is perfect for the man of today, the timekeeping is also perfect as you would expect from Tag Heuer. The chronograph is working as it should and adds that touch of class to this watch. Encased in thick stainless steel and enticing us with its attractive numbered bezel! Case measures 41mm in diameter and 44mm from lug to lug. The dial is black and clean with the logo in the centre, there are the usual luminous markers, quick set date at 4 o’ clock and luminous hands, all under the sapphire crystal in perfect condition. The crown can screw in/lock and features the logo, case back also has the logo and screws in. Model/serial numbers are CAC111B-0 #REW5822. 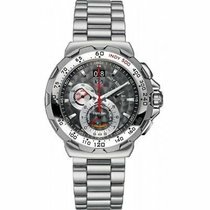 It features the original strap in stainless steel with double lock clasp, s/n BA0850-0 and measures approximately 7.5” or 19cm. The original box and papers are long gone, but we have provided an aftermarket Tag Heuer box to go with it. It has not been pressure sealed, so water resistance is not guaranteed.